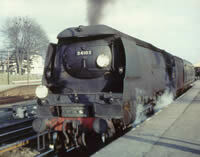 Archive film of steam along the East Coast Route from KINGS CROSS to YORK before it ended south of Peterborough in 1963. There are detailed views of KINGS CROSS terminus, PETERBOROUGH and DONCASTER with visits to Top Shed and GRANTHAM. Motive power shows A1, A2, A3 and A4 Pacifics with B1 and V2 classes putting in appearances. The Eastern suburban services up to 1962 were worked by L1 and N7 classes and scenes from LIVERPOOL STREET to BETHNAL GREEN, CHINGFORD, HERTFORD EAST and BISHOPS STORTFORD are seen.The LTS line via DAGENHAM to SHOEBURYNESS is covered with LMS 2-6-4 tanks. SPALDING is seen as a diversion off the East Coast line before the North Eastern Region is reached. That is covered by a journey over the STAINMORE line on its last day of service in early 1962 and in 1967 with a K1 hauled special to BISHOP AUCKLAND. Rare footage of the Flying Scotsman train in the 1930′s is included and the GRIMSBY & IMMINGHAM line before it succumbed to closure. Mostly filmed in colour from 1959 to 1967 but some black and white footage is included. 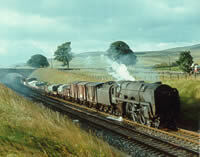 A detailed commentary and authentic sound-track completes a nostalgic look at LNER steam. The fourth volume in our series of Southern Steam finales covers the two months of August and September 1966. There was much to see during the last full summer of steam in the South. The weather was good and we have chosen the best scenes to portray the Southern scene in general and the railtours that ran in the two months. Two tours took Bulleid Pacifics to Nottingham on the Great Central, Bulleid stock went as far north as Penistone behind an electric loco of Class EM1. Reciprocating these visits there were two Eastern pacifics, travelling on Southern metals, 60532 “Blue Peter” and 4472 “Flying Scotsman”. A general feature is the story of Southern boat trains, passenger, freight and gold bullion!. 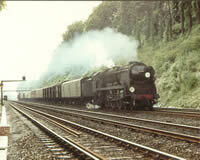 02′s on the Isle of Wight still ran but Black 5′s visiting the region ended with the summer timetable. The Swanage branch is seen in detail before it lost its regular steam service in the September. All these stories are related in this programme allowing 15 different classes to be seen. Filmed by competent cameramen, using the best of equipment, this really is the definitive story of Southern steam at the end. There are only another five volumes to go !! 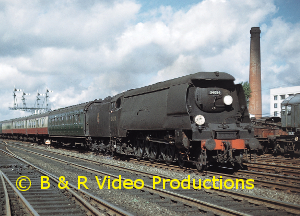 We have been fortunate indeed to obtain film from Douglas Haines of the lines south of Birmingham taken from 1960 onwards on 16mm Kodak stock and all tripod work. This volume takes us through the southern approaches to Birmingham, the Lickey Incline and on through Barnt Green and Kings Norton with the Halesowen branch, the GWR route via Hatton Bank and then the North Warwick line through Henley-in-Arden to Danzey. A feature of this film is the workings of the locomotives on the three banks of these lines with long detailed shots of engines working hard and the rolling stock of the time, now just a memory. All three sections feature the normal service trains applicable to them such as Jubilee, Scot, 9F, 3F, 4F etc. on the Midland with Hall, Castle, Grange, 9F and Standards on the Western. Nevertheless each section also has one surprise visitor. 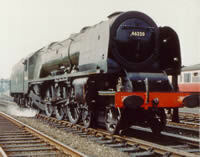 The Lickey has SR unrebuilt Pacific 34079 climbing banked by a 9F. Hatton shows us the restored GWR prairie 4555 on a brick train and the North Warwick line affords us a view of an ex-LMS 4F coupled to ex-GWR 6435 passing through on a railtour. The film covers all seasons from high summer to mid-winter with snow scenes around Kings Norton where surprise, surprise, ex-LNER 4472 “Flying Scotsman” passes by on a 3-coach private special which includes the ex-Devon Belle observation car. 4079 “Pendennis Castle”, while still in BR ownership, concludes this fascinating video which all true enthusiasts will want to have in their collection. 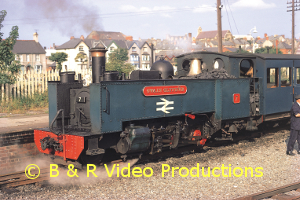 A few diesels in their early BR liveries are seen, but this film is 95% steam. No modern day or preservation material has been used in this video. Cover photo: Jubilee 45577 “Bengal” climbing the Lickey Incline. Complementing Volume 21 we cover main lines and branches from the Midlands to Scotland and the East Coast Main Line. The “Wandering 1500” railtour using B12 61572 from Broad Street to Stratford-upon-Avon via Bedford and Northampton is followed by steam at Tebay and a long section of steam in 1967 on the Settle and Carlisle line. Scotland is reached via a railtour from Manchester using Merchant Navy 35026, Jubilee “Bihar & Orissa” and 4472 “Flying Scotsman” via the S & C and Waverley Routes. Through Fife with J37s and V2 60813. Then a look at A4s, Standards and Black 5s between Aberdeen and Perth. Duchess 46245 “City of London” is motive power Kings Cross to Doncaster for a visit to the Works where we see 60014 “Silver Link” withdrawn but still intact. Scenes at KIngs Cross and Wood Green in 1963 with A4, A3, A1 and WD are relived. 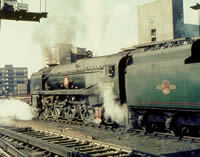 Tours with 60007 in 1963 and later as 4498 in 1967 at Peterborough preclude seeing “Flying Scotsman”’s last departure from the `Cross as 60103 and its early forays on BR as 4472 with two tenders and even a Chime whistle. Oh yes, even “Clun Castle” climbing Potters Bar all go to making this a video you should not be without. 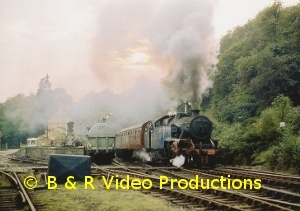 There are nine sections in this film starting with LNWR 790 “Hardwicke”. This remarkable veteran stretched her legs for a short time in the 1970s. Colin White followed her. On one trip to York double-heading with “Flying Scotsman” he was even in 4472′s cab for part of the journey offering an almost unique filming opportunity. Other scenes see her in action in the Lake District. Heaton Mersey, coded 9F, with a study of Stanier’s 8Fs coming and going on this shed in its last months of operation where manual work on the coal stage was the order of the day. The fascinating crane tanks at Doxford’s ship yards near Sunderland offer us another form of locomotive. Filmed in 1970 they work hard around the yard before returning to the shed for a lunch break which used to lead to complaints from road users of smoke nuisance.. and what smoke! This is followed by more unusual locomotives in the guise of narrow gauge articulated types. Fairlies on the Ffestinog are followed by Saxon-Meyers in East Germany with transporter wagons and the amazing Herberlein brake; engines sporting a steam operated bell. The Mallett articulated engine is next studied again in Germany where 0-4-4-0 tanks work hard in the snow. Finally to Portugal for some 2-4-6-0 Mallett tanks around Regua and the smaller 0-4-4-0 types at Porto. An A4 meets an unrebuilt Bullied in 1967 when 4498 visited the Southern, ah! the charm of the chime. Returning to the continent for a few minutes to sample super power with a potted look at 2-10-0 types in Germany, Austria, Poland and Czechoslovakia. Double headers in the snow and a train with 3 2-10-0s as motive power. Even if your loyalties lie with the Big Four you cannot but help marvel at the power of some of these continental giants and in some superb locations. 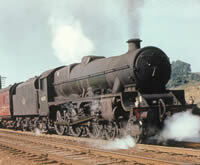 Back to our shores 6115 “Scots Guardsman” had two main line outings in 1978 from Dinting to York. Both occasions were captured before she disappeared from the scene to hopefully re-emerge in the 2000′s. We cover the Isle-of-Wight in Volume 21 and will do so in later productions but this section is a tribute to the last day railtour on the 31st.December 1966 when the LCGB visited the island. The tour featured the Class 02 tanks which were at the time the oldest locos in BR stock. Finally a few Bullieds act out their last duties around Bournemouth and Poole including 34001 and 34100. This production features pre-1968 BR steam in the North, much of it in Scotland with some extraordinary special workings dating back to 1959 with locomotives that have been in museums for 30-years since. The first section shows BR steam in and around the Dumfries area in the early 1960′s. The inevitable Black 5 is well covered, but also a 2P, Jubilees, Scots, Clans, an A2, A4s and Britannias. Locations include Beattock and Quintishill. The second section shows main line specials with a difference. “Gordon Highlander” double-heading with the Caley Single. Jones Goods and a McIntosh 0-6-0. 46255 “City of Hereford” is seen, as is 60004 “William Whitelaw”. The last Highland Railway No.103 is captured before she was ensconced in Glasgow Museum. 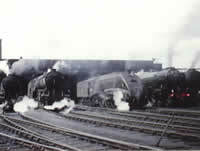 “Flying Scotsman”, “Sir Nigel Gresley” and “Clun Castle” (in Carlisle) are seen in the 1960s and “Maude” in 1980. The final section (25-minutes) brings us up to date with glorious scenes of the Highlands as we follow and ride behind 5407 on the Fort William to Mallaig line in 1984. Breathtaking line shots of the locomotive bounding away through the Scottish hills and along lochs in glorious sunshine, over Glenfinnan viaduct and into tunnels.